For your serious Sunday consideration, from Double X Science physics editor, Matthew Francis. If you had to name the top scientists of the 20th century, any reasonable list must include Polish-French scientist Marie Sklodowska Curie. 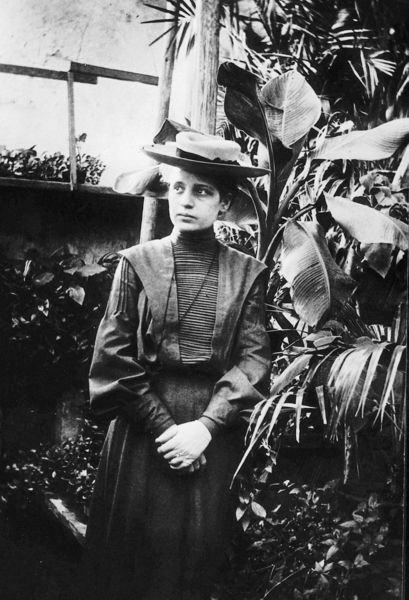 She won the Nobel Prize twice, a feat only matched by three others: once in physics (in 1903) for her work in radioactivity, a term she coined; and once in chemistry (in 1911) for her discovery of the two chemical elements radium and polonium. Her first prize was shared with her husband Pierre, himself an excellent physicist. She went on hiking trips with Einstein, who complained that she was too energetic in her walking style, as he preferred to dawdle. She was also the only female participant in the great Solvay Conference of 1927, which included many of the great innovators in modern physics. The element curium (96 on the periodic table) and several research institutes are named for her. How can you not admire Curie? Let's face it: she kicks all of our butts. It's easy to think of her as one of the Great Woman Scientists, but without a doubt she was a greater scientist than most of us can ever hope to be, male or female. 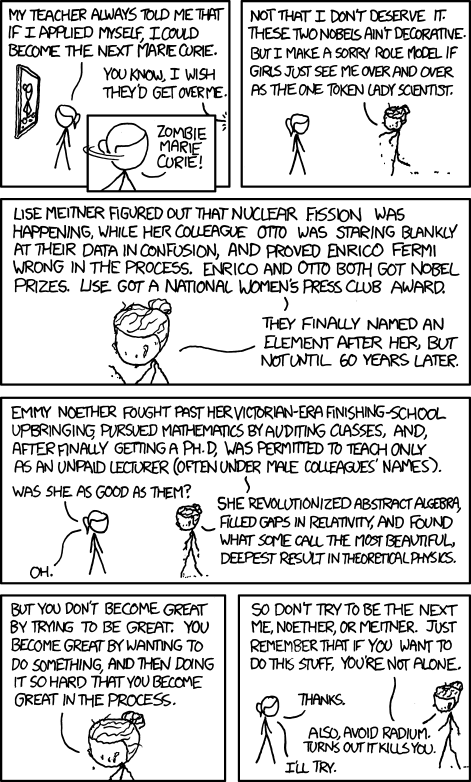 At the same time, anyone thinking they aren't great because they aren't a Madame Curie should stop worrying. One side effect of tokenism — letting one or two representatives from non-majority groups stand in for their entire group — is that it truly sets standards far higher than are reasonable. Curie was an outstanding scientist by any reasonable standard, as was physicist Lise Meitner, who discovered nuclear fission, or the great mathematician Emmy Noether. But here’s the deal: each one of those women stood head and shoulders above the vast majority of their colleagues, male or female. Astronomers like Caroline Herschel, Annie Jump Cannon, and Henrietta Leavitt are justly remembered for achievements that outstripped many of their male colleagues, who often actively opposed their advancement. The majority of scientists aren’t the Nobel laureates, the ones who get remembered in textbooks. For a male scientist to be remembered in the past, it was often enough to make a minor discovery; for a female scientist to be remembered, she had to be better than all her colleagues in addition to overcoming the sexism endemic in academic life. 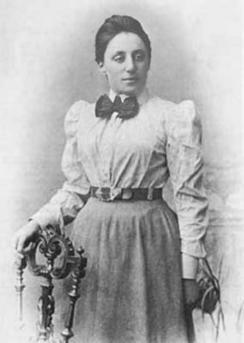 Personally, as a theoretical physicist, I wish I could be half as noteworthy as Noether. Who wouldn’t aspire to that, male or female? Yet the situation is better than it seems for us ordinary people. Evolutionary biologist and science writer Stephen Jay Gould pointed out that it's not that there are fewer geniuses: it's just that there are so many of us working in every field that it's harder for one person to rise far above the others. Speaking personally, I know more math than Einstein, a lot more physics than Newton, more astronomy than Galileo or Herschel...and I'm just an average scientist, not in the same league as a Curie. A typical physics training today includes the calculus Newton discovered, the physics Einstein contributed, and a bunch of stuff that has come since they worked. Science keeps pushing on, and that's a good thing. We are surrounded by women every bit as awesome as Marie Curie – you yourself may be one of those women. You don't have to win two Nobel Prizes or discover new elements to be rad. (See what I did there?) There's a whole other post to be written about how the Nobel Prize singles out just a few people when science is a collaborative venture, but I'll spare you all. Let's not worry about being Marie Curie or presenting her as the best there can be for women in science. With so many more people working and contributing than there were in 1903, there may never be another Curie, but that's not a bad thing. There can be a hundred Curies.